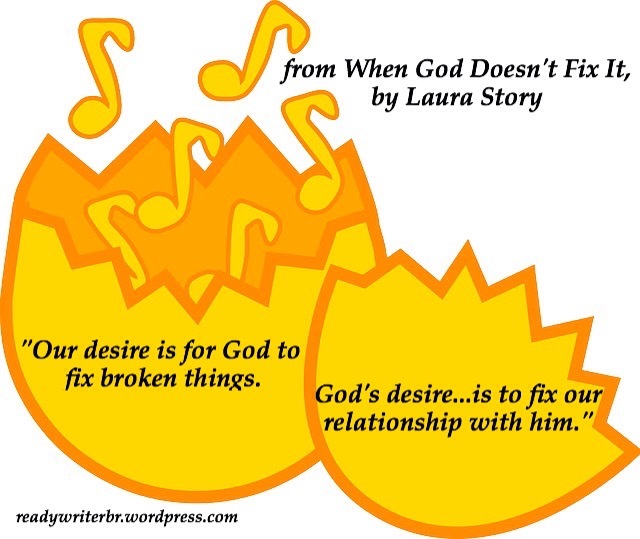 It’s Memorable Monday again, and this week’s book review and memorable quotes come from When God Doesn’t Fix It, by recording artist and worship leader Laura Story. When they married in 2004, Martin and Laura (Story) Elvington had plans for a perfect life. Their intention was to move to Savannah, Georgia, where Martin would finish his degree at Savannah College of Art and Design (SCAD). He would also continue as campus director and Bible study leader for a college ministry and do graphic design and web development for Wofford College, while Laura toured with a traveling band and wrote music for their concerts. When Martin completed his training, their hope was that he would find a well-paying job in the graphic arts field and move back to Spartanburg, South Carolina, to be near their parents. Laura would then become a stay-at-home mom and raise the children they both wanted to have someday. The first detour in their plans came in 2005, when Laura was offered a job as worship leader at Perimeter Church in the suburbs of Atlanta, Georgia. At first, Laura was hesitant to accept the job since she had no experience leading worship. But when a friend of their’s from the church kept encouraging them, and they learned the church was offering a steady income and health insurance, and that SCAD had just opened an Atlanta campus where Martin could complete his schooling, they decided to make this move. But as they prepared to move, Laura became aware of some things that concerned her. Martin was more forgetful than usual. And some days, he wanted to do nothing but sleep. He was also having symptoms of panic attacks, but none of his doctors had been able to pinpoint the cause of all of this. Laura spoke by phone with her boss-to-be, Randy Schlichting, telling him something was wrong with her husband and she was having second thoughts about taking the job. Randy encouraged them to load up their belongings and come to Atlanta as soon as possible, promising that the church would take care of whatever was wrong with Martin once they got there. So in August of 2oo5, Martin and Laura moved to Atlanta and she began learning how to be a worship leader. To not give away the rest of the story, in a nutshell Martin required major surgery. It was scheduled, but things didn’t go as hoped. Martin and Laura’s story was forever changed. Instead of God performing a miracle and fixing Martin’s problems, God was more interested in building his and Laura’s relationship with Him. This is a “not to be missed” book, especially if you’re going through a hard time yourself or are a fan of Laura Story’s music. The book is filled with MEMORABLE quotes, making it difficult to choose just one. I choose a rather long one from the same chapter as the above myth and truth, and then I’ll close with a graphic of a shorter quote. Ok so now you have me putting this on my “not to be missed” reading list! What an encouraging story…can’t wait to read all of it! It had some hard lessons in it, but it really is worth reading, Dinna. This book sounds amazing too- my list is getting longer and longer. I love the quotes. Laura Story’s song “Blessings” is one of the main things that helped me through when things were especially difficult with the friend I wrote about last week. I probably listened to it at least two or three times a day for over a month! I’d be interested to read her story. I didn’t mention this in the post, but Laura shares how difficult it was for her to share that song, because it’s basically her story. But God made it clear to her that it was to be shared, and so many have been blessed by it. Definitely a story I’d like to know more about. Thank you.